Pay no single room supplement on this tour! Days Two to Seven: Free in Gouves with two included tours. The Northern Crete Countryside. An excursion with a visit to Knossos and wine-tasting! During this tour you will be taken back 4.000 years to the time of the oldest civilisation in Europe. The Minoan Palace of Knossos, centre of the Minoan Civilisation, will leave you breathless as you wonder over the technology and facilities of that period. 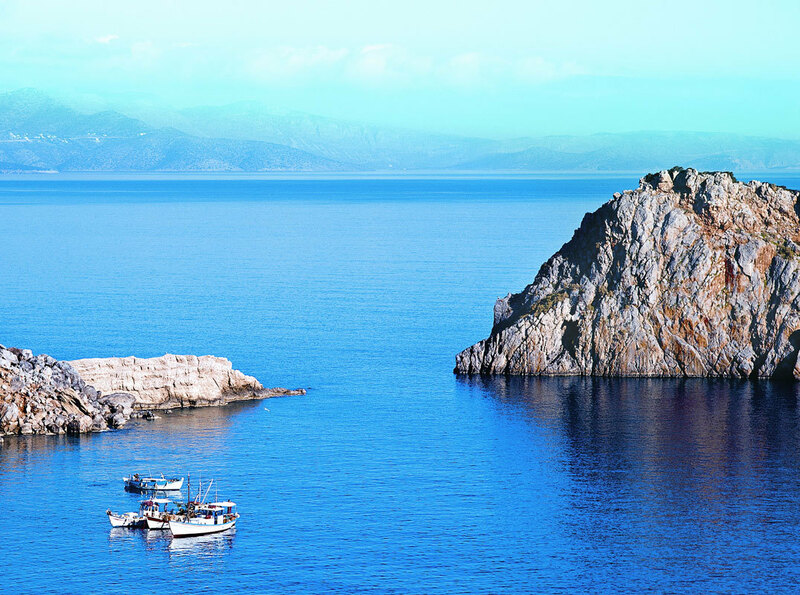 Then experience a wonderful drive through the island’s hilly countryside where the olive groves, orchards and vineyards have changed little since Minoan times, before arriving at a local wine producer to learn about wine making and taste local wines. There is free time for lunch and to see the day to day life in the traditional village of Skalani. 44 miles today. Traditional Crete and cooking! You travel to a mountain village for an introduction to Cretan cooking and learn to prepare some Cretan specialties in the local style. As a reward for your efforts lunch is included today! If you prefer to leave all your cooking skills at home and not participate in the cooking workshop, the surroundings are ideal for walking or a sit-down in a coffee house in the village and meet the locals. After lunch you visit the open-air museum at Lychnostatis which offers an insight into authentic Cretan life. In a guided tour you will marvel at Cretan architecture and the old traditional life style. You can stroll in the gardens and admire the fruit trees and the bright coloured flowers before returning to your hotel. 32 miles today. As well as the included tours there will be an optional tour capturing the Venetian influence in Crete. You drive west into the region southeast of Rethymnon and visit the Arkadi monastery – one of the island’s most famous due to the holocaust it suffered in 1866. It is now a memorial for the freedom from the Turkish occupation. Built during the last Venetian period, it was a well-equipped little fortress where people could find refuge in times of trouble. From here it is not far to the village of Margarites next to a beautiful green ravine. This place is famous for its small pottery workshops and you get the chance to observe a local potter at work as well as discovering the history of the Cretan ceramics from the Minoan period till the present. From there you travel by coach to the city of Rethymnon to enjoy a guided walk through the charming old quarter including the Venetian harbour and the narrow streets and squares with Turkish and Venetian architecture.